Major Canadian licensed weed producers are mostly dissatisfied over the federal government’s latest requirements for how recreational weed should be packaged and labelled. Health Canada is placing strict requirements on how all cannabis products will be packaged and labelled once legalization takes place later this year. 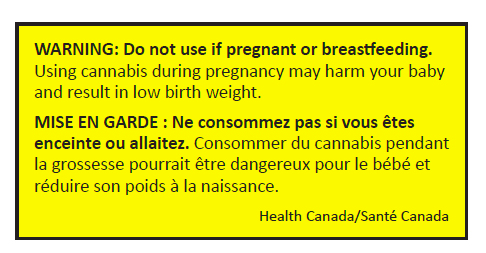 Cannabis must be packaged in a single, uniform-coloured container or bag that will display a standardize cannabis symbol in red, white and black, and a bright yellow label with one of six health warnings on it. Weed companies may display their own logo on the packaging, but it will not be allowed to exceed the size of the standardized cannabis symbol. In addition, brands will be prohibited from displaying any other image or graphic on the chosen packaging. Under the present Access to Cannabis for Medical Purposes Regulations regime, medical cannabis producers are not subject to any kind of packaging or labelling restrictions on their products. Medical producers will have six months upon legalization to alter their packaging in order to meet the new requirements — recreational weed will be packaged according to the new rules from day one of legalization. “Taking the relative health risks of cannabis into account, we hoped and advocated for rules closer to those for beverage alcohol but we'll work with this as a starting point,” Canopy Growth Corporations spokesperson Jordan Sinclair told VICE Money. Kennedy believes that the government took into account the views of those in the legal industry committed to “black market eradication”, a point of view that Aurora’s Battley vehemently rejects. “They need to understand that if they want to address the central objective of legalization which is getting rid of the black market, they have to let us compete effectively,” Battley said. The Senate is set to vote on the federal government’s pot bill on June 7th, upon which royal assent will follow. It will take between eight to 12 weeks after legalization for provinces and territories to prepare for retail sales, meaning that legal weed will only really be available for purchase in September of this year.